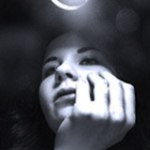 Alexandra is from Russia and is studying journalism in Canada. Recently awarded a scholarship, Alexandra shares her experiences with us in her blog! You don’t have to travel far to find a place that will inspire you. And if you can learn a thing or two during your visit – that’s even better. It certainly worked for me. 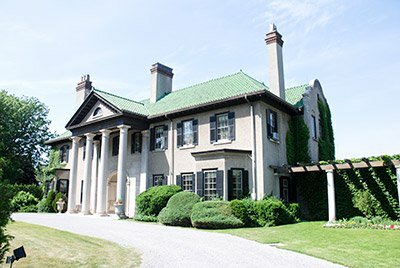 So, here are some of the most interesting places in Oshawa, which I’d like to share with you. The Parkwood Estate was the home of Colonel R.S. McLaughlin, who founded McLaughlin Motor Car Co., which later evolved into General Motors. The building’s architectural design represents an amalgamation of different styles. The recreation area of the house contains a squash court and an indoor swimming pool. I was amazed by the building’s greenhouse wing, which includes the Palm House, Orchid House, Japanese garden and greenhouses, which create truly beautiful scenery. So, it’s no surprise that Parkwood is one of the best locations for filming. The Parkwood Estate – both as exterior and interior – appeared in a number of Hollywood movies and TV series, including X-Men (remember “Dr. Xavier’s school for gifted youngsters”), Chicago, Studio 54, The Tuxedo, Bomb Girls, Monk and Warehouse 13. Actors who filmed at Parkwood include Adrian Brody, Ben Affleck, Hugh Laurie, Bob Hoskins, Woody Harrelson, and many more. If you are a fan of modern and contemporary art, the best place to visit is the Robert McLaughlin Gallery (RMG). 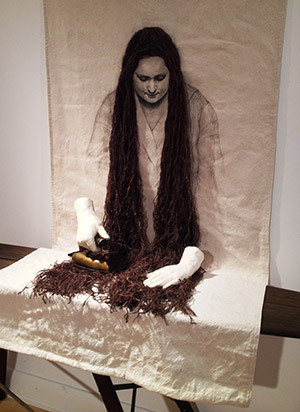 I visited the exhibition of an Oshawa-based artist Toni Hamel there. Her drawing “The Improvement” shows a woman ironing her own hair which flows out of the picture on to a real ironing board. For some reason, it reminded me of the creepy girl with long black hair who climbed out of the well and through the TV in The Ring movie. Another exhibit, called “The Exodus,” consists of thousands of paper cranes. 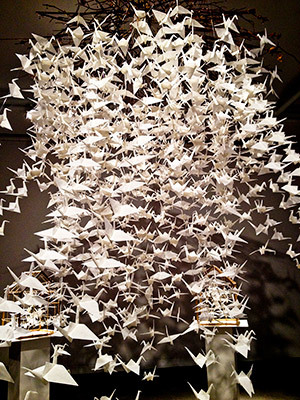 In a dimly-lit room white cranes flying upwards from cages look exquisite and stunning. Oshawa, “Automotive Capital of Canada,” is the headquarters of General Motors Canada; therefore the Canadian Automotive Museum can’t be located anywhere else. There are a lot of interesting displays crammed into one museum – Rolls-Royce, Model T, Jaguar and much more. In addition to the Canadian cars showcased on the upper floor of the museum, you can also find some exotic cars – the Amphicar looks pretty cool. Plus, the admission fee is only $5, so you’d be nuts not to visit it. And, if you are interested in Second World War history, the following places would probably be of interest to you – Camp X, a Second World War spy training facility, as well as the Oshawa Military and Industrial Museum, pretty much every vehicle in its collection is operational.